Designed for controlling a broad range of flow rates of liquids and gases, CV™ Utility valves are available in three conveniently overlapping orifice-needle sizes. These versatile, rugged and reliable, valves are suitable for laboratory instrumentation, bench top or OEM flow control purposes. Valves are offered in straight (T) and 90 degree (L) flow patterns. All valves are supplied with 1/8” FNPT inlet and outlet ports. 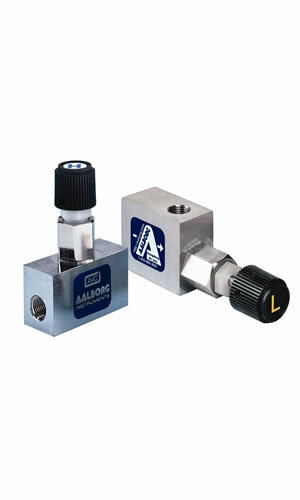 Valve cartridges are also interchangeable with built-in valves of Aalborg’s series of P, T, S, and G flow meter product line. The valve body is precision machined chrome plated brass or type 316 stainless steel.